Silvio Giuntoli was born in Alguscio (Firenze), Italy in 1890. He immigrated in 1904 and married in 1919. He and his wife Lena Mary (1893-1962) bore no children, but a niece Verna lived with them as of the 1940 census and was listed as a daughter upon Lena’s death. Silvio was naturalized in 1942, six years after his wife. His education ended at sixth grade. His World War II draft card described him as standing 5’4″, 160 lb, with gray eyes and hair, and “left hand missing.” A short item in the Tribune on 26 August 1954 said he “has been a one-armed cement finisher since the age of 35 when he lost his left hand at the wrist in a concrete mixer.” That accident, then, would have been in 1925. He first appears in the 1923 directory at 1159 Elmhurst Avenue, the old name of 91st Avenue. (It’s still a sweet little street.) He moved to 9853 A Street in 1929, where he lived until his death in 1968, but the address on his stamp never changed. 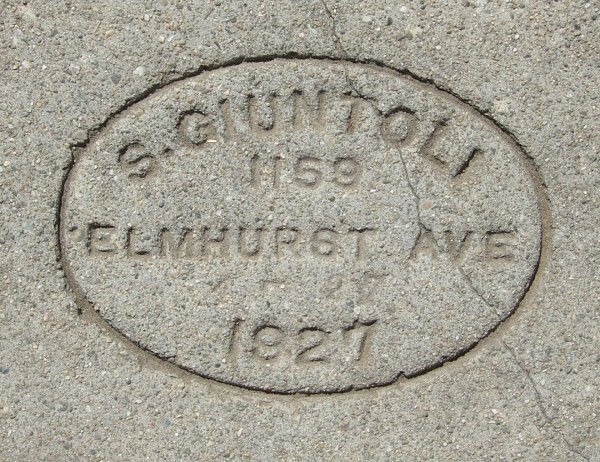 I believe he had his first sidewalk stamp made in 1927; it looked like this. For the next few years, he erased the final digit of the year and wrote it in by hand. As of 1932, his stamp bore only the “19” of the year, and the remaining digits, as well as the month and day, were impressed with a separate set of very small numbers. 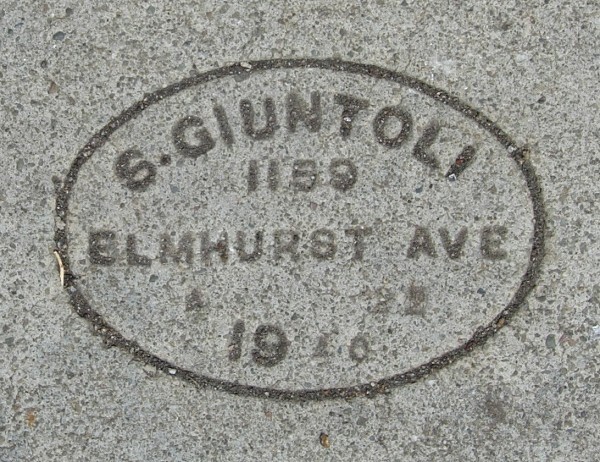 I have documented Giuntoli marks in Oakland from 1927 to 1950. They’re all over town, but especially thick around Elmhurst. This entry was posted on 28 September 2018 at 8:59 pm and is filed under Profiles. You can follow any responses to this entry through the RSS 2.0 feed. You can skip to the end and leave a response. Pinging is currently not allowed.